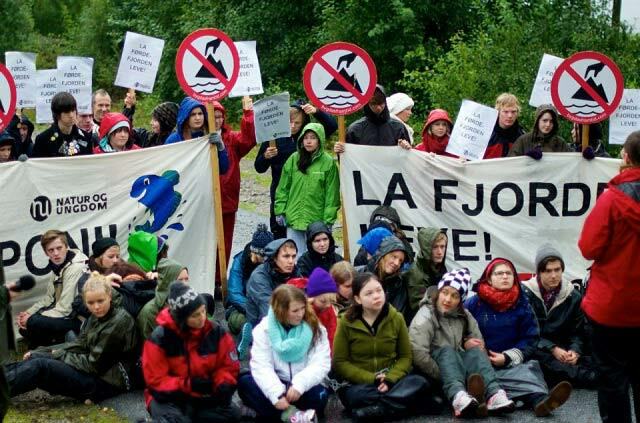 Photo: Amanda Orlich | Natur og Ungdom members gather against the planned seafill in Førdefjord. she is 18 years old and her name is Sigrid Høeg. inherit as well as being deeply mindful of the future they will leave behind. parents can be very proud of. activities that promote a safe ecological footprint as an end goal. to see what the Oslo Kommune decides at its meeting on the 24th. being put towards the livelihoods of all people’. certain death and starvation due to flooding and loss of land. other sources of income and energy. encourage and replace the status quo. and then on the International scene to facilitate change amongst other nations. practices and this has only got to be good for the environment. og Senya. This area is renowned for its salmon fishing and spawning grounds. these communities or to the fishing grounds. are the better off for it.